After that ridiculously long post of Mighty Morphin', I'm glad all of these will now be less than a hundred episodes to cover. With the next two series, it was clear Saban was trying to push for bigger changes more quickly to allow the popularity of the franchise to thrive. Zeo changed everything right off the bat. Well, all but the Rangers themselves, and Angel Grove as a living community. Turbo also did the same thing. So let's take a look at Zeo, then Turbo, and see how they shape up. Zeo starts directly after the ending to Alien Rangers. Rocky, Adam, Katherine, Tommy, Billy, and Tanya are left in the wreckage of the Command Centre, wondering what to do next. They find the Zeo Crystal and fall down to the complex under the Command Centre. Meanwhile, Rita and Zedd are being forced away by the forces of the Machine Empire. Rito and Goldar have lost their memories and wonder the streets of Angel Grove trying to find out who they are. They bump into Bulk and Skull, who take advantage of the two and put them to work as their servants. The opening definitely does a good job of showing the change that happens. New villains to battle. New powers for the Rangers. A new way for our comedic duo to have some fun. With six former Rangers and only five powers to give, Billy takes a sidestep to become technical adviser to the team. With Tanya filling Aisha's place as Yellow Ranger, the team go and beat up some Cogs - the Machine Empire's foot soldiers who were sent down to test the planet's defences. And it's here that one of my biggest flaws with Zeo comes up. The main villains aren't very interesting. We have King Mondo, conqueror of many planets, and his wife Queen Machina, and their son Prince Sprocket. This being the Machine Empire, of course they're robots. But that isn't what makes them not interesting. It's the fact they don't really seem to do much. Yes, they're commanders of their army, but they have no-one to really react to other than themselves. At least with Rita in season one of Mighty Morphin' she had Squatt, Baboo, and Goldar around, and those four were more active in the field. And nothing else about the start of Zeo really has much interest surrounding it. A few episodes in we get Tommy and Katherine working on an assignment where they pretend they're married with a kid, and that provided some fun, but most episodes weren't really entertaining enough, though Katherine was the stand out for me in these episodes, especially those that focus on her. The only other entertaining episode is when Billy looks to be going for an extended trip to Aquitar. Here we have Cestro of the Alien Rangers return, looking for Billy. He bumps into Bulk and Skull, who agree to take him to the only Billy they know. Once Billy and Cestro get talking, it is clear that Billy wants to help, but that obviously means leaving. And he doesn't want to have to say goodbye to the Rangers, so leaves without doing so. The Rangers find out about his plans but arrive too late. Contact is made for Billy to make it up to them. Some growth of Bulk and Skull also happens, with Skull scared of what Bulk would say if he knew Skull was practising classical music. With some helpful words from Adam, Skull gives it his best to put aside those fears when he appears on stage, and Bulk accepts him for the brilliant piece of music he performed. There's also some more growth for the two later on. With Billy returned to the Rangers after a bit of trouble, things now start to pick up. There's No Business Like Snow Business starts this off with a letter to Tommy. Kimberly writes to say how great it has been after moving away, but she has unfortunately met someone new and is calling the two of them quits. Tommy is heartbroken after this, so Billy and Katherine decide to take him on a weekend trip away snowboarding. The Machine Empire tries to ruin the fun, and the three save a famous snowboarder from those plans. A spark of interest forms between Tommy and the snowboarder, which Katherine tries to take further once they return to Angel Grove. It's hard to have a relationship if you're a Ranger, and that is proven here during a candle-lit dinner between Tommy and Heather, the snowboarder. This leaves Tommy feeling roughly the same, but a dance with Katherine seems to cheer him up. It takes quite a while for Tommy to really recognise those feelings Katherine has for him, but maybe that's for the best considering what he's about to go through. Tommy starts having dreams about his quest which started in Alien Rangers, where he was given an arrowhead and told to find his destiny. What he finds is that he has a brother. Each was tasked with protecting their half of the arrowhead, and King Mondo is interested in its powers. In trying to protect his brother, Tommy reveals his Ranger identity, which his brother is accepting of. Tommy and David split the arrowhead once again to protect it, and David leaves for some time. The Machine Empire is starting to feel more active now, and start to get more enjoyable. The growth of Bulk and Skull happens in Bulk Fiction, and while they are being goofs at first, this point more than any shows they have heart. The police chief's daughter starts working at the station, and Bulk falls in love with her, and wants to ask her out. His antics are noticed by the chief, who commands Stone to have words with him or he'd be off the force. When it does happen again and the chief fires Stone, Bulk and Skull decide to go with him, on the grounds it was their fault he got fired. It's good to see them do things like this, especially when you think how they were during Mighty Morphin's first season. Stone sets up a Detective Agency, with Bulk and Skull as his team. 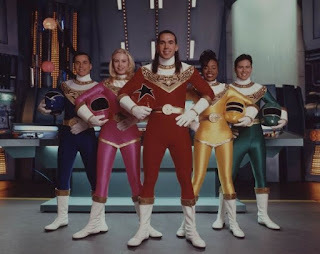 When the Gold Ranger is introduced, there's a feeling that the team are now better than ever, as it always does. Though the identity of Gold isn't known. David is back with Tommy during a surfing contest that gets interrupted by Mondo's plan to pollute the Earth's water, and soon the Gold Ranger is revealed. Pyramidus gets shot down and lands on Aquitar, with Cestro sending the unconscious form of the person inside to Earth by teleport. Trey of Triforia is the Gold Ranger, but due to his form being split in three from after-effects of the attack, he is now unable to use the Gold power. This is where the original Red comes in to help. Jason returns to take up the mantle of Gold. It is during this arc that Rito and Goldar start wondering where they came from, which is convenient as Rita and Zedd have reappeared, and want them to return. Their memories returned, the two meet up with Rita, Zedd, and the rest in a mobile home on the moon. It is here that the Rangers also get new zords - the Super Zeozords. Mondo takes matters into his own hands in the next episode, and gets destroyed himself. This sets up a plan for Rita and Zedd to start taking over, but the robot they plan to use goes rogue when Rito and Goldar lose the remote. In a reversal of roles, the two get Bulk and Skull to find the remote, which the Rangers and rogue robot are already fighting for control over elsewhere. The last quarter of the series has the robot Louie Kaboom being the main villain for a while, where he unearths Auric the Conqueror and tries to convince him the Rangers are evil. After seeing the light thanks to help from the Rangers, Auric says he will be ready to help if needed. Louie's short-lived time running the Machine Empire is up as the eldest son to Mondo appears to take control. Prince Gasket and Princess Archerina send Louie to Angel Grove, under the spell of love, to prove himself to Archerina. He eventually goes Kaboom once the Rangers put him down for good. Rita and Zedd are glad the Rangers did them a favour, and continue working on ways to take the Machine Empire out. Tommy is kidnapped by Gasket, who modifies his memory so he has no idea who he is. This sets up King For A Day, where Gasket convinces Tommy he is King of the Machine Empire. Tommy's energy has been passed onto a new monster, and in an arena is put to the test to prove himself. This arc really sets up that Rita and Zedd are willing to do anything to rid themselves of the Machine Empire, including helping the Rangers. This is also a personal quest for Jason, who had already let Tommy down before way back in Mighty Morphin'. Tommy and Jason get into a fight, the rest of the Rangers arrive and have to fight as well, before Katherine gets the idea to demorph in the hope that seeing their faces will awaken the memories of Tommy. Bulk and Skull get yet another time to shine, helping one of the prisoners destroy the controls for the barrier that stops anyone from leaving the arena. Nearing the end of the series, Another Song and Dance makes Tommy and Tanya start operatically singing every line they speak. It sure is entertaining to hear, especially as it rolls over into their morphing calls. The episode also shows that King Mondo is fully repaired and ready to get back into battle. Which happens in Rangers of Two Worlds. Rita and Zedd have accidentally created a monster that appears invincible. Mondo is back on the attack. And Billy is starting to age real fast due to his regrowth while the Earth was still back in time during Alien Rangers. As such, they call on the Rangers of Aquitar to help them in this situation. There's entertainment to be had with this two parter, as the evil teams square off against each other, take over the Zeo Megazords to fight each other, and of course two full teams of Rangers fighting against evil. While I'm still not sure why the effects of Billy's time tampering took this long to take effect, it is certainly a better send off for him than the others of his original team, which gets reflected in the end credits, as a montage of his time on the show plays out. That leaves just one thing left. The destruction of the Machine Empire. Which Rita and Zedd do to great effect. The Gold powers are also leaving Jason, so Trey of Triforia is called back in the hope they can be formed back into one at the same time the Gold powers are transferred back. Bulk and Skull are contacted by an agent for some detectives to help him in France, which the two eagerly accept. They tell Stone of this, and while he is sad about their departure, tells himself that they will be back. A final battle plays out with the Rangers taking on Mondo and Cogs supersize. Yeah, the Rangers were allowed to grow to the size of their Megazords for the final battle, thanks to Trey of Triforia - who is now back in possession of the Gold power. With the battle over, Mondo and family berate Zedd on the moon for not joining in the fight. With Zedd saying they were outclassed, he hands them a parcel. A bomb. Driving away in their motorhome laughing, Rita and Zedd watch as said bomb explodes and leaves the leaders of the Machine Empire scrap. Oh, Turbo. You're not really selling yourself as much of a continuation, are you? We get a time skip, and in that amount of time, everything seems to have changed. Though I think the biggest part of that is Bulk and Skull. From Zeo, they are now... back to police officers? With Stone given another chance? Then Bulk and Skull get turned into monkeys and Stone is now the manager of the Juice Bar? It's as though they couldn't think of how to keep the three together during the time skip, so put the last chance at police in just to say that's what they had been doing. Either way, we Shift Into Turbo and continue. The three part opening arc has some explaining to do. Rocky retired from being a Ranger and new kid Justin taking his place. The Rangers also already have their Turbo powers. A montage explains how these things happened, but it still doesn't answer everything. Such as where Rita and Zedd disappeared to. That montage footage also comes from the film, which acts as a prequel of sorts to the series. New villain Divatox is seeking revenge on the Rangers after her first defeat at their hands, so travels to Earth in order to set up base underwater. As well as a new villain, new help is at hand for the Rangers. 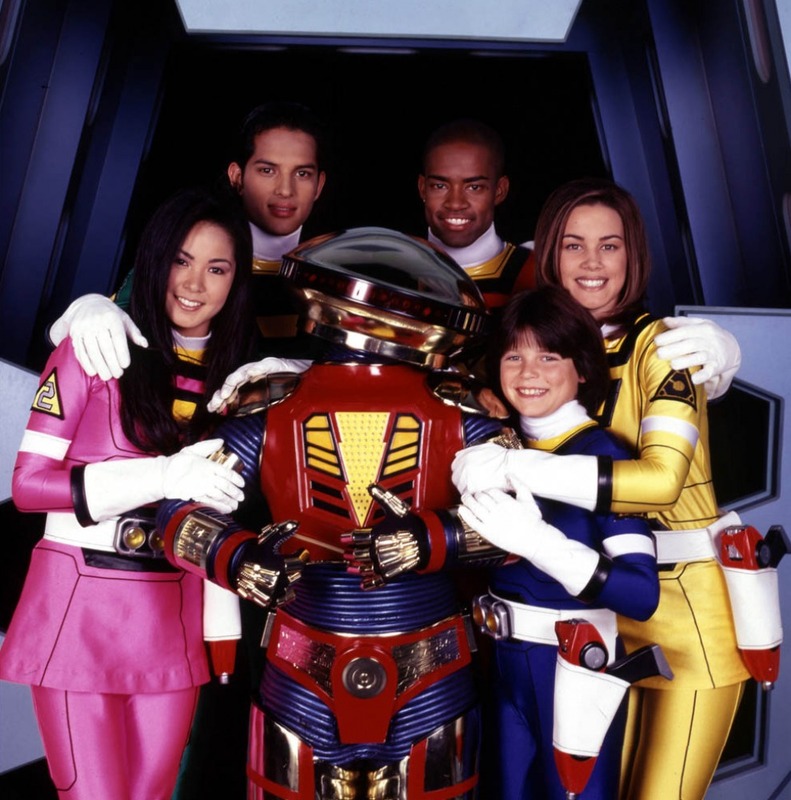 With Zordon and Alpha-5 leaving for Eltar - Zordon's home planet - Dimitria and Alpha-6 are on hand to aid the Rangers. Justin's introduction has him feel a little impulsive. While alone in the Power Chamber with Alpha-5, the cries of monkey Bulk and monkey Skull are picked up, so Justin says he'll investigate. When he runs into Elgar, he rushes into battle without calling in, even when overwhelmed by Piranhatrons - the foot soldiers of Divatox. It is only when the others, concerned about his non-arrival at the graduation ceremony, head off and call in that help arrives. While I wouldn't say it was a strong start, it does well to communicate that big changes are coming. And acts as a transition to Dimitria and Alpha-6 running the Power Chamber. Again though, Turbo suffers the same as Zeo did, in that it is a slow start. We get a messenger appear on Earth to deliver a message to Dimitria, and once Divatox gets her hands on said messenger and fails to hear what he has to say, turns him into a monster and sets him to destroy the Rangers. The messenger is revived at the Power Chamber, and tells Dimitria that she has a sister, who had been unknown to them all this time. Is this obvious enough yet? Add that to the fact Divatox's plan is almost exactly the same each time with little variety in execution, things do get a bit wearisome. There's some interesting character interactions to keep you going though, such as Tanya using her radio show as a way to contact the other Rangers to head to her location. Justin gets a lot of the spotlight, and who can blame the show for doing it, considering he's the new kid. That doesn't mean the others don't get time to shine. Without the characters themselves doing new things though, the first few episodes of Turbo aren't at all interesting. The thirteenth episode brings a new message for Dimitria, this one from the future, informing about a joining of evil forces. Again this message gets intercepted by Divatox, but this time she gets to hear the full Millennium Message, while the Rangers only get a part of it. The messenger, the Blue Senturion, stays on to help the Rangers while they figure out a way to return him from where he came. Carlos and Ashley are introduced in the next episode, with both soon-to-be Rangers partaking in a football game. Carlos a player, and Ashley a cheerleader. Carlos doesn't seem to get that working as a team is important though, but both Adam and Ashley help him see that. Honey, I Shrunk the Rangers is a two parter that takes things a bit more seriously. With all but Justin shrunk to bug-size and trapped on Divatox's ship, another detonator is with Bulk and Skull. The chimps have stolen Jerome's car and taken a trip around town. This is the point where I felt Turbo started to get good. Of course, the more serious tone started to come into it from this point on, balancing very well with the more light-hearted stuff. The Rangers escape Divatox's ship with the torpedoes that super-size monsters, which returns them to normal size. With Bulk and Skull at the beach with the detonator, Justin takes it while the chimps watch from near the torpedo impact point. Which makes the two return to normal, though are also turned invisible. Passing the Torch is the second two parter, and introduces TJ and Cassie as they arrive in Angel Grove. The two come across trouble as Tommy is getting attacked. This is the only episode for a long time in which the stakes of the game felt real high. Tanya, Adam, and Justin are being attacked by two monsters, who have managed to stop them morphing. Tommy is down, and Katherine is doing all she can to protect him. TJ and Cassie run into the two and help. Though with more Piranhatrons than the three can handle, Tommy is taken while they are distracted. The other Rangers manage to outsmart the monsters they are fighting and reach Katherine. 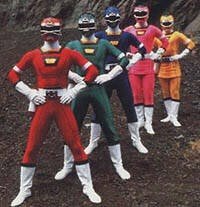 In the end, with a monster super-size and destroying Angel Grove, and with Tommy still missing, the four Rangers do everything they can to protect the city. TJ and Cassie have gone on their own mission to find Tommy. Though they don't know about him being a Ranger, it is ultimately that decision which gets them both chosen to become Rangers. With Carlos and Ashley also chosen, and Justin staying on as Blue, Tommy, Katherine, Adam, and Tanya are let go as Rangers. It is a bit sad to see them all go, but the change was meant to tie into the Millennium Message and allow for the current actors - who had been a part of the team since Mighty Morphin' - to head out and pursue other things. I'm guessing yet another time skip happens here, considering the new team seems to be friendly to each other - something which wouldn't be a thing after just a few days. TJ and Cassie knew each other. Carlos and Ashley knew each other. Justin never had much if any interaction with any of them, yet they all feel like a tight group of friends in the next episode. 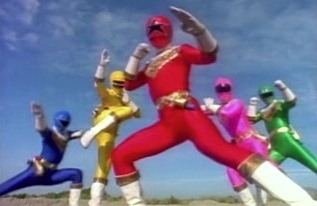 From this point on, the morphing sequence is shortened, and each ranger no longer says their power during the morph - something which continues throughout the various seasons. Also from this point, Bulk and Skull continue their comical antics by trying to find a permanent job. The next few episodes slowly introduce the Phantom Ranger. One episode takes a time twist, reversing time to undo the failures of Elgar, who still manages to fail in the end when Clockster freezes himself on the Freeze Key. The Phantom Ranger is the one who undoes that mess. And the Phantom Ranger is the one who gives the other Rangers their new Rescuezords. From The Darkest Day, Hilary Shepard Turner returns to the role of Divatox, having been on maternity leave since filming the Turbo Movie. Carol Hoyt did a good job with the character, though made Divatox less of a diva than her name suggests. As for the arc itself, we get General Havoc on the scene - Divatox's brother. He's brought some new things with him, so the Subcraft takes a trip to space and docks with the Space Base. The Turbo Megazord is sent out to do battle and is captured. Phantom Ranger takes them below Angel Grove to give the Rangers the Rescuezords, and do battle once again with Havoc in his Metallosaurus. Divatox and Havoc plan to capture the Phantom Ranger, and succeed by capturing Cassie and tricking the Rangers with a disguise. After a Clash of the Megazords, the Turbo Megazord is back in the hands of the Rangers, and with his job done the Phantom Ranger leaves. Throughout all this, Bulk and Skull have been running a Monster Tour with Stone. The idea being they travel to areas where monsters have done battle with the Rangers. They try to drum up business by faking monster and Ranger reveals. It's a bit of fun throughout the more serious arc. As we get near the end, it becomes clear the balance is just about right for the season to pull off a decent ending. Most between-arc episodes are usually more brighter, fresh air from the longer, more serious plots contained within the arcs. Some of these last few sure had that same amount seriousness involved. Divatox is still being a diva, and comical hi-jinks still exist, but watching these episode, it could be believed that events will be changing. Justin's dad returns to Angel Grove, setting up for the finale. Cassie and Ashley try their hand at winning the affections of a new boy in town, and Divatox has been working on her own set of zords. The Rangers manage to overcome these zords, but the final battle is yet to be. Parts and Parcel is the last episode before the Chase Into Space arc, and it features Bulk and Skull in fear of not just losing a job, but getting arrested. Working to deliver packages, their boss isn't pleased that missing items are being reported, and Bulk and Skull have got the blame. Working with the Rangers, they uncover Piranhatrons stealing the packages for parts. With Bulk and Skull running to avoid arrest, the Rangers do battle with all three Evil Zords, and just as Bulk and Skull are about to be arrested, return morphed to prove their innocence. The two thank the Rangers, and when they reappear unmorphed after teleporting out of the Juice Bar, Bulk and Skull thank TJ for his help. And now the finale. Chase Into Space starts with Justin's dad going to a meeting about a new job. Later in the Juice Bar, his dad says he has got the job, but hasn't accepted. He wants to know what Justin thinks, as it will mean moving away from Angel Grove. Justin doesn't want to move though. On the moon, Divatox meets Goldgoyle, who says he will destroy the Rangers. And that he does. The Rangers sacrifice the Rescue Megazord, and get the Turbo Megazord destroyed. TJ uses Lightning Cruiser and the Turbo RAM set to explode to destroy the monster by planting the bomb inside its mouth. Elgar has found the Power Chamber, and shows it to Divatox. The whole army gathers to attack. With Dimitria and the Blue Senturian on Eltar after Zordon's message of an attack on the planet, the Rangers are left alone with Alpha to defend themselves. Bombs planted inside destroys the Power Chamber, and outside Divatox receives a message saying the Dark Specter calls her to the Cimmerian planet. Powers gone, the Rangers still decide Divatox needs destroying. They follow her to space. Justin manages to get into the space centre and calls for the commander to listen to his message from the Rangers. Cleared for use of a shuttle, the Rangers load up. Except for Justin, who stays. I found myself liking the ending more than I'd anticipated. It shows how, despite being the shortest serving Rangers, they will still do whatever it takes to defend the Earth. It also shows Justin being a bit more mature about the situation at hand. He loves his dad, he loves being a Ranger, and he loves Angel Grove and all the people he has met. Even if the others weren't going to face the perils of space, I think he still would have come to the same decision. TJ, Cassie, Ashley, Carlos, and Alpha-6 head into the unknown reaches of space. Zeo is an enjoyable season, with a few missteps along the way. It presented some interesting stories for the team, and returned Jason to the team. However, I feel Turbo was slightly better. Divatox and crew were much better villains than the Machine Empire, even though I have said both seasons started slow. With Zeo, the potential exploration of characters had pretty much dried up. Turbo gave them a bit of room away from the school, and when the new cast arrived we were able to explore that group. While I don't normally do ratings, I still rate groups of things within lists. As such, the season will be slotted in to a list of my favourite to least favourite. Next month will feature the end of the Zordon era in Power Rangers In Space, as well as the start of the Post-Zordon era in Lost Galaxy.